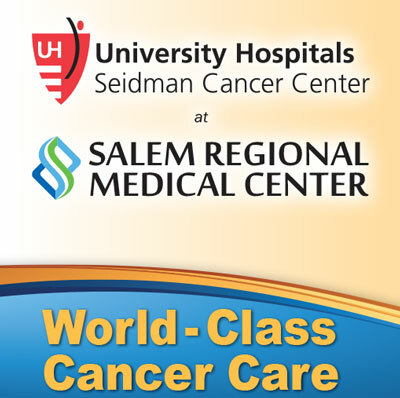 Salem Regional Medical Center is transforming cancer care in our region through a strategic partnership with the University Hospitals (UH) Seidman Cancer Center that offers renewed hope in the fight against cancer. Provided by Ayla Kessler, M.D., Medical Director, in SRMC's Cancer & Infusion Center. William Demas, M.D., and Michael Seider, M.D., provide radiation therapy in SRMC's Salem Medical Arts Building, using the new Varian Vitalbeam™. Our local medical and radiation oncologists, specialty physicians and 14 multi-disciplinary teams of experts at UHSCC's main campus work together to develop patient treatment plans based on nationally-recognized guidelines. We will soon be the first hospital in the region to offer clinical trials, many of which involve promising new therapies before they are widely available. Barb: "We feel blessed to have this level of care in our community." Judy: "My husband received such wonderful treatment here. The thought of going anywhere else never entered our minds."